The elderberries are ripe! The elderberries are ripe! The elderberries are ripe! The most effective natural remedy for cold and flu season is elderberry syrup! Children love it! Moms love it! Dads love it! It is good for sore throats, coughs, and general malaise. 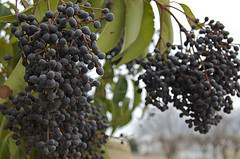 Now is the time to make your elderberry syrup for the winter. It is simple to make and readily available across North America growing in almost state and province. Picking elderberries is easy, but destemming them takes patience. Combine berries and water. Bring to boil, lower to a simmer, and cook for 20 minutes. Using a colander lined with cheese cloth or a food mill, strain the skins from the liquid. Return to the liquid to the pot, add sugar, and cook down to a syrup consistency. Optional: Add a squeeze of lemon juice. This year, I am freezing elderberry syrup. In the past, I have stored it in the refrigerator or made it with brandy to last longer; however, we typically run out before cold and flu season and need to purchase more.